Gel pens are one of the best creative gifts for women I recommend because they are so versatile. 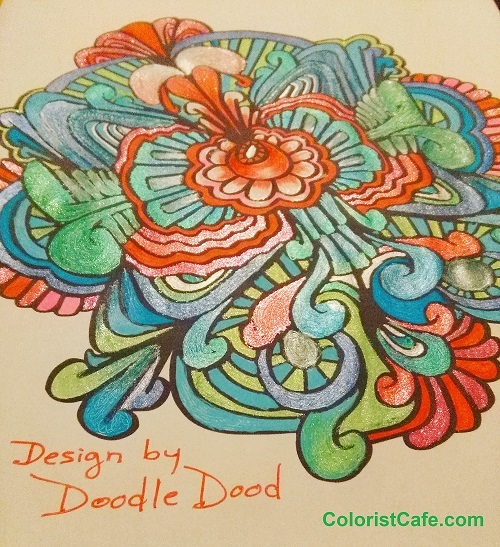 They can be used to color or highlight adult coloring pages, doodle in journals, write tasks on planner pages, beautify altered art or scrapbooks, or even to create nice invitations and thank you notes. Early last spring I WON a GelWriter 75 pen Easel Set from entering a contest by GelWriter (an ECR4Kids.com brand) and was thrilled when I got them! It’s a nice large set of pens and the case is AWESOME! It folds into an easel-type stand, making it very easy to see and grab the pens. 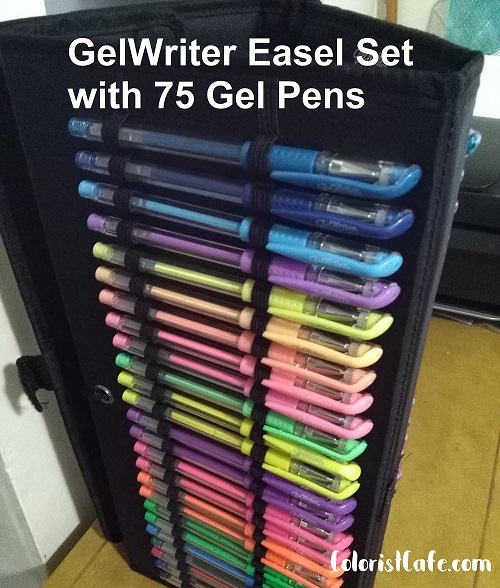 While GelWriter makes several variations of gel pen sets, I’ll only be discussing the easel set because that’s the one I know about personally. First, I want to point out some great benefits about these gel pens. GelWriter has lots of color choices to give your coloring pages pizzazz. GelWriter has several fun ink styles that make your art stand out. Beside the basics, there are metallics, colored and neon glitter, pastels and neons. GelWriter has a smooth, juicy flow of ink. Handy carrier for lots of pens – 75 in this case. Fun colors and ink styles to choose from (there may be some duplicates or colors that are very close to each other). Well-made case that can be folded several ways and closes with Velcro. Case allows for storing pens horizontally. Nice ink flow and juiciness for wonderful smearing effects. Two of my pens leaked, one badly. Sliding pens back in to the elastic loops in the case requires 2 hands and may be difficult for those with arthritis or dexterity issues. Juicy Ink can get all over your hands or arms and even ‘ruin’ your coloring page. Depending on how you think about this, or use the pens, depends on whether you see the ink flow as a positive or a negative. To some it’s a negative because it causes a mess. It really can, and it’s happened to me (Notice my hand and the page in the image to the right.) Fortunately I was able to ‘clean it up’ by covering it with another technique. (Scroll about a third of the way down that post and you’ll see the fun solution.) What other solutions might be used to fix a ‘mistake’ like this? What have you done before? On the positive side, juicy ink will slide around to cover more area and blend well with other shades or colors. And if you want to get creative with the inky-ness, you can try the tool Coloring Bliss recommends to smear it. Smearing gives a wonderful effect and I love doing it! To add to what I’ve already mentioned, I looked up some reviews on Amazon to see what others had to say about these pens. Bleeding through the page – I’ve had a minor amount of bleed-through, but I always recommend using a couple of backing sheets with any wet type coloring tool. TIP: Make sure you check all the tips of the pens when you first get them to make sure they are tight. Large area coverage – Gel pens, in general, will run out of ink quickly if using them in large coloring areas. I use them in smaller areas and to highlight already colored areas. They can really jazz up a page! I’ve had these gel pens for almost a year and I’m still happy. 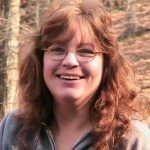 When I was on Amazon (at the time of this post), the set just like mine – 75 pen Easel Set – was on sale for a really great price! In fact it’s cheaper than the 36 pen set! You might want to check to see if it’s still on sale because normally this set is on the pricey side. Here’s another view of the case and if you click on the image (my affiliate link), you can see more on Amazon, including the reviews and larger images. -One of my favorite hand-drawn floral coloring books, Fabulous Florals, by Tina Golden. -A fun new Suess-style coloring book (for men, women and children), Doodle Dood Organic Coloring Book, by Evan “Doodle Dood” Brown. -And if you’re looking for something a little more crafty, check out this flower paper craft that you can make or buy for a coloring friend. Here’s to more coloring with gel pens! P.S. 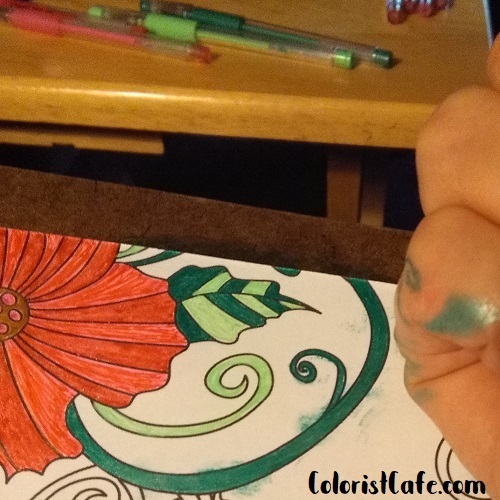 Have you tried GelWriter gel pens? I’d love to hear what you think of them! Write your comments below. And if you haven’t signed up for my email list where you can get notifications about other great posts like this, go HERE.